As a architect/consultant designing and building SBC, VDI and Desktop environments one of largest challenges during the project is to find out which applications are being used and secondly who is using that applications exactly. The project is often the point that the customer would like to have the assignment and usage of application under control, so the project team need to find out which applications are out "there" and who is actually using them. Ask the users/departments to deliver this information: often the users have got this question many times before and don't want to spend time on that or they forget to mention some applications because they think IT knows that they are using that one. Let the IT project team make an inventory: often this is done by untrained personal, who does not know where to look for, so again applications are forgotten. Use an software product: Most products collect the information out of the Add/Remove Programs options, so this only tells which applications are installed and not who is actually using them. It's clear that none of these methods gives you all the information, which often leads to a project that fails. What has RES PowerFuse to do with that? In the time that PowerFuse 2010 was in a beta stage I found out during one of my meetings that they were building a feature to automatically build up the RES PowerFuse environment for a new platform collecting data from current environment. So that's partly I was seeking for, because that feature does not exactly matches the result I was looking for. Then they told me that PowerFuse 2010 has the ability to turn on or off every component within the product. With that new feature (in previous this was not possible) I saw the solution I was looking for. In this article I will describe how you can use RES PowerFuse to collect which software is available within the organization and who is using it, without any impact on the users. Let me make clear that I don't think this should be the reason to buy PowerFuse for, because the product is created for the managing the User Environment market. However when you would like to use PowerFuse in your infrastructure, this option is very useful. If you are already familiar with RES PowerFuse you know the component called Usage Tracking, otherwise the component can be best described as a part of the product that monitors the application usage. As you can read this information is what we need. With the option to enable/disable components we can install RES PowerFuse already on the current environment and only enable the Usage Tracking component. In such way the application usage is being monitored on the back and the users don't notice that RES PowerFuse is already active. 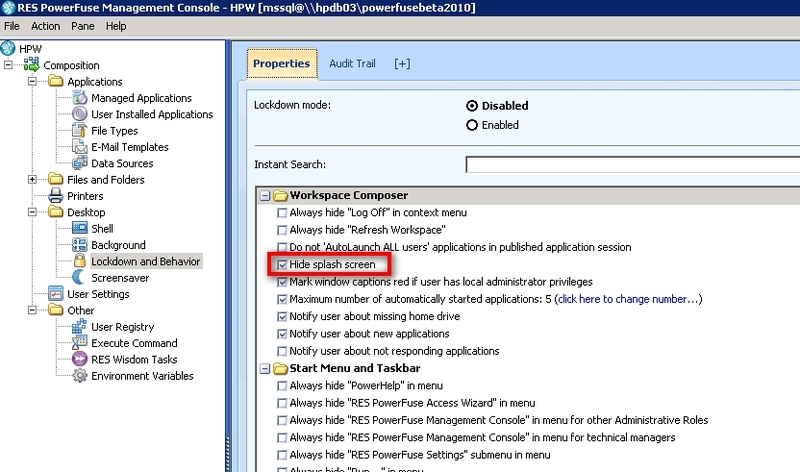 To achieve this first we need to configure PowerFuse in such a way that only Usage Tracking is enabled. This is done using the Workspace Model option within the Setup tab. In this new version you can enable or disable the components. As display in the below figure you can see that all components are not active (by selecting disable or do nothing at the management application component). In this way only usage tracking is active. By default RES PowerFuse starts with a splash screen showing the progress of RES PowerFuse. If you don't want that users suddenly get that screen, than you can disable the splash screen within the Composition Component under Desktop - Lockdown and Behavior. Logical you should enable the Lockdown and Behavior option so the settings are applied. Also consider the other options within this component thoroughly because they will also be applied when you enable the Lockdown and Behaviour setting. I noticed whenever all options are disabled (except Usage Tracking) the user still get the first time notification from Power Print that no default printer is selected. Probably this was caused that initial the home drive component was enabled. However if this is the case you can solve that to configure the MessageDefaultPrinter within the pwruser.ini as described in this RES knowledgebase article (http://support.ressoftware.com/Modules/KnowledgeBase/knowledgebaseTreeView.aspx?id=803). Logically the RES software should be available on the clients the users are working on to function. RES PowerFuse can be easily installed via an unattended script. The script can be run as a start-up script (via Microsoft GPO) or deployed using a EDS (Electronic Distribution System). Secondly PowerFuse should be started when a user logs on. I achieved that using a GPO User Logon script, but other solutions are possible. The below shown figure is a small script I used as the logon script, because we don't want to start the information for all users, we created a group that won't start the PowerFuse executable. Logically you should keep the environment running for a while so the information collected is representative, so you don't miss specific applications that are only used periodically (for example once a month). 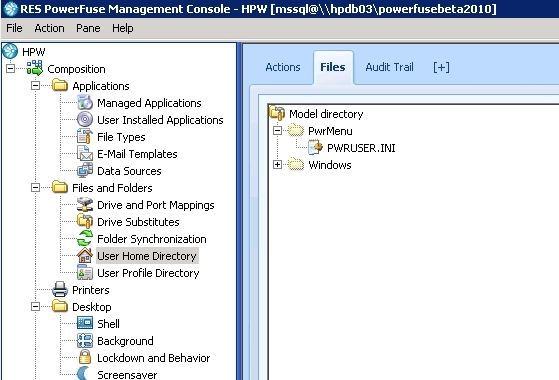 After that time frame you can start the Usage Tracking out of the PowerFuse Management Console. 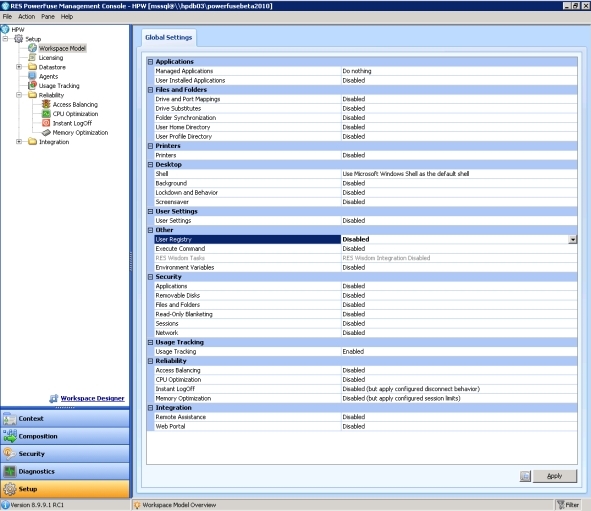 Depending on the current configuration you can select the user, OU or computer tab. I always use the graph tab all application and select the corresponding user or OU, to display the collected information. It will show the used applications logical name or the corresponding executable, but also some visited websites. The following figure is an example of the information shown by Usage Tracking. In project where RES PowerFuse will be used in the new environment the product can also be used to determine the actual usage of application by users via the new feature that makes is possible to enable specific PowerFuse components. The results are shown within the Management Console, so there is still manual intervention needed, but it shows the information needed and no other software need to purchased. If it suits the needs for your projects depends of the possibilities (for example install software in the current environment) and if the manual steps are workable.